Noosa River Sandy Shores is a perfect getaway located amongst the heart of Noosaville. There is so much to see and do, why not come and stay a weekend. Our onsite managers would be happy to help you with any sightseeing suggestions, or any other information or help, required to make this a perfect holiday. The Noosa River Sandy Shores team will go the extra mile to ensure your holiday is a success. Apart from being in the heart of Noosaville, these immaculate units have everything you will need to enjoy a relaxing holiday. 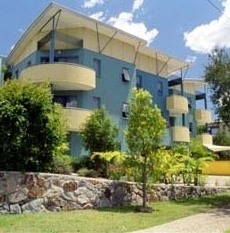 The complex is situated just a short stroll to 27 of Noosavilles most exquisite restaurants, the Noosavillage Shopping Centre and of course the ever popular Noosa River on Gympie Tce. The most beautiful views of the sunset ever imaginable from the river front just at end of the street. Children under 5 yrs of age are free. Extra guests and children over 5 yrs will be an extra $20 per night. Undercover parking and a Lift from the car park to Reception on Level 1. The car park is secured in the evenings. Noosa is full of wonderful things to do and places to go. We are in walking distance from the river which houses such activities as boat hire, jet ski hire, not to mention great fishing. The river is renound for it's great sunsets why not come and check them out. Noosa is only a stones throw away with its great beaches, national parks and of course Hastings Street. To find out more about Noosa, and what is on around the place come and speak to us, we can help with ideas to satisfy any craving for adventure.